The Kosuge Slip Dock Nagasaki is a site of Japan`s Meiji Industrial Revolution. Western ships the Japanese purchased through Nagasaki-based Western traders near the end of the Edo period were mostly older vessels that had been in use in the seas around China. As a result, they were constantly in need of repairs. In response to the demand for a repair dock, in 1866 the Scottish merchant Thomas Blake Glover helped draw up plans for such a facility. The Kosuge Ship Repair Dock, completed in January 1869, was the first modern Western-style dock, which used a steam engine in Japan. In 1869, it was purchased by the new Meiji government and placed under the jurisdiction of the Nagasaki Iron Works. In 1887, ownership of the repair dock passed to the Mitsubishi conglomerate, and the site remains in the possession of Mitsubishi Heavy Industries today. 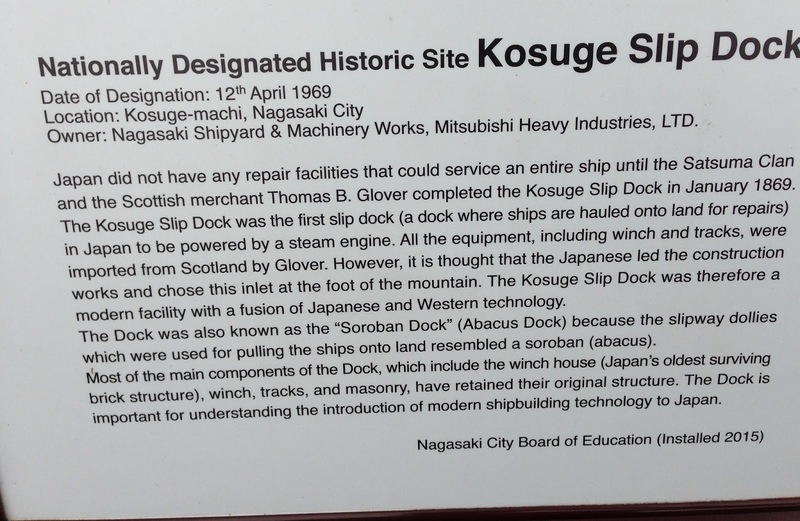 The Kosuge Ship Repair Dock was a slip dock designed so that at high tide a ship could be set on dollies that were hauled up along tracks running from water to land by means of cables and boiler-powered steam winches operated from a winch house. In this way, workers were able to make repairs and do maintenance work on the ship’s bottom. The Kosuge Slip Dock and winch house are the oldest structural remains of modern naval technology in Japan and provide a rare and valuable example of such transplanted Western technology in the late Edo period and early Meiji era. As naval vessels grew in scale and the Tategami shipyard began operating full throttle, Kosuge Ship Repair Dock came to be used exclusively for work on small vessels, until it finally closed down in 1953. In 1969 it was designated a national historical site. The Kosuge Slip Dock Nagasaki is a great site to look at in order to realize how Japan did actually convert from a feudal system to the economic superpower that it is today. By taking the technologies from the West and putting them into practice but also fine-tuning them and making then better and more efficient than their competitors allowed them to reach the heights that they did in the 1970`s and 80`s. As we speak the Iron/Steel, Shipbuilding and Coal mining of Japan have been inscribed to the 2015 World Heritage List.